﻿﻿﻿﻿﻿﻿ What can I say .. a dog's gotta eat, right?? Might as well do it in style as far as I am concerned!! 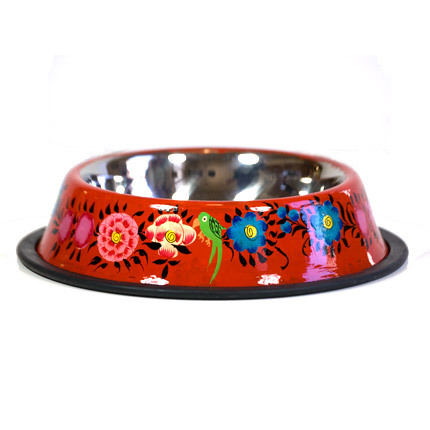 Gummi Pets Brights Blue Feeding Bowl can be found here. Given how quickly the Missoni line sold out at Target, we are thinking this design is very "current." We're gonna put this on our " Dear Santa" list for sure! Faux-bois -- just kind of rolls off the tongue, doesn't it? 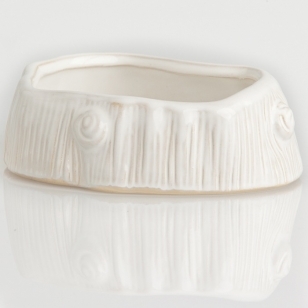 You can find this fabulous bowl here at The Life of Ryley. I think I want to be Ryley! You should know two things about something that comes from a store called Snooty Dog: it is going to be expensive and mom is gonna love it. 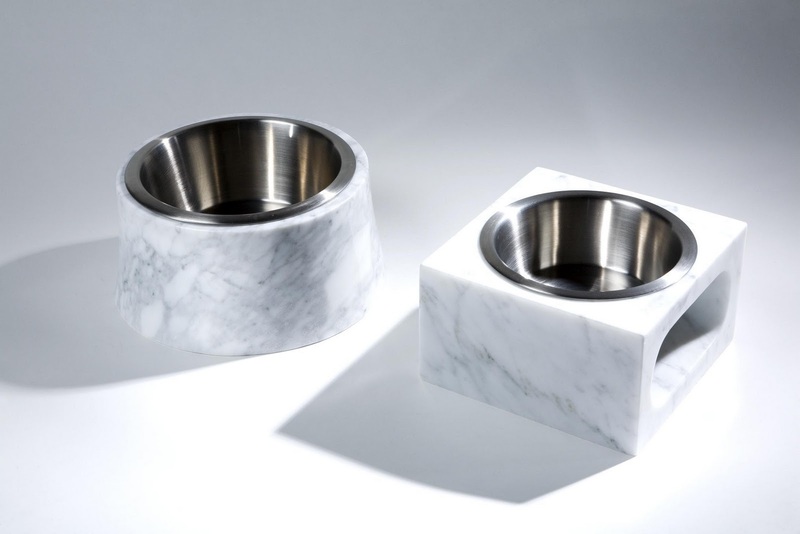 You can find the carrera marble fancy feeders here. If you're like me and you dream of seeing your name in lights, this personalized bowl is for you and you can find it here in a few different colors. Very reasonbly priced, too! And, last but not least, our feel good bowl. This one is hand made by artisans in India and it is absolutely beautiful. 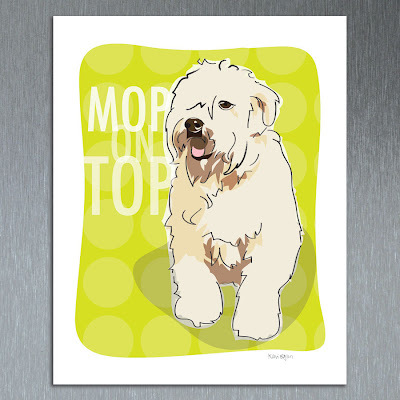 You can check this and other fair trade goodies for puppers right here. And just one more thing about food ... do any of you other puppers out there eat Blue Buffalo food? I am just wondering if any of you pick the dark bits out like me ???? Here's hoping you get to chow down this weekend everybody! I think it is safe to say that given how often The Puperie hits the road to attend adoption events, we see alot of adoption/shelter related graphic design. We saw this one over on Cafe Press (check it out here) and really thought it was clever. The design really makes you look closer! And, if you are a part of our Texas fan club, we thought you would appeciate this one as well! No, no. Your eyes do not deceive you. 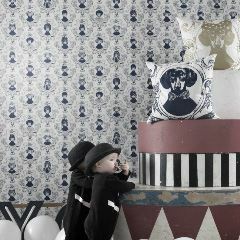 There really are weiner dogs on that wallpaper. 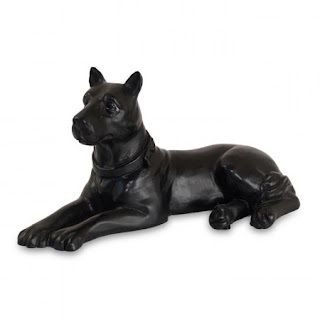 Indeed, they are dressed in all sorts of finery and would be perfect for a dog house any area in your home needing that little touch of whimsy. If you're interested, you can find it here. If the wallpaper is a little too over the top for you, the same designer does pillows and prints too, so head on over and check it out! Ok. I have gotten over myself. I have come to realize the error of my ways ... if I would not bark at everybody that comes near my mom, I might to get to go with her to some of these events. 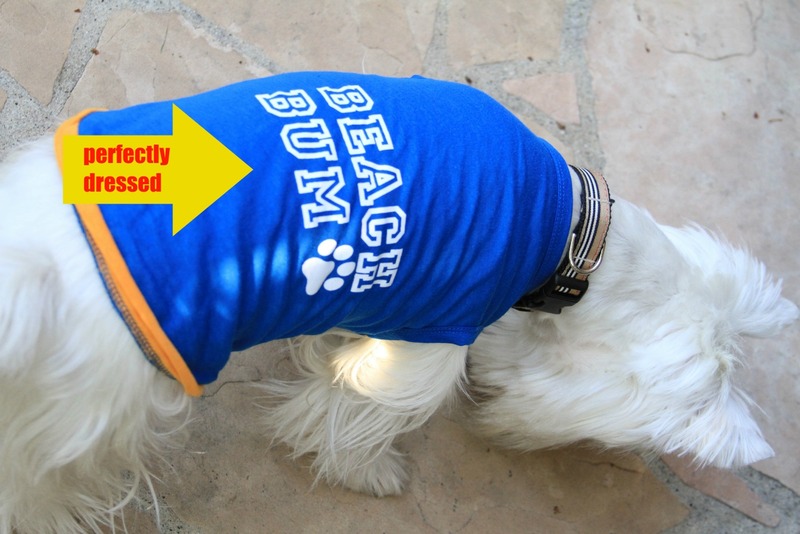 Yep, might have gotten to keep my job as Marketing Director for The Puperie. From Surf Dog FB page, Dude. 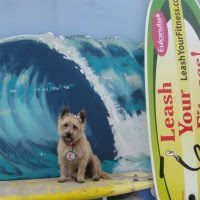 Our friend Jack, from Leash Your Fitness WITH A MEDAL!!! 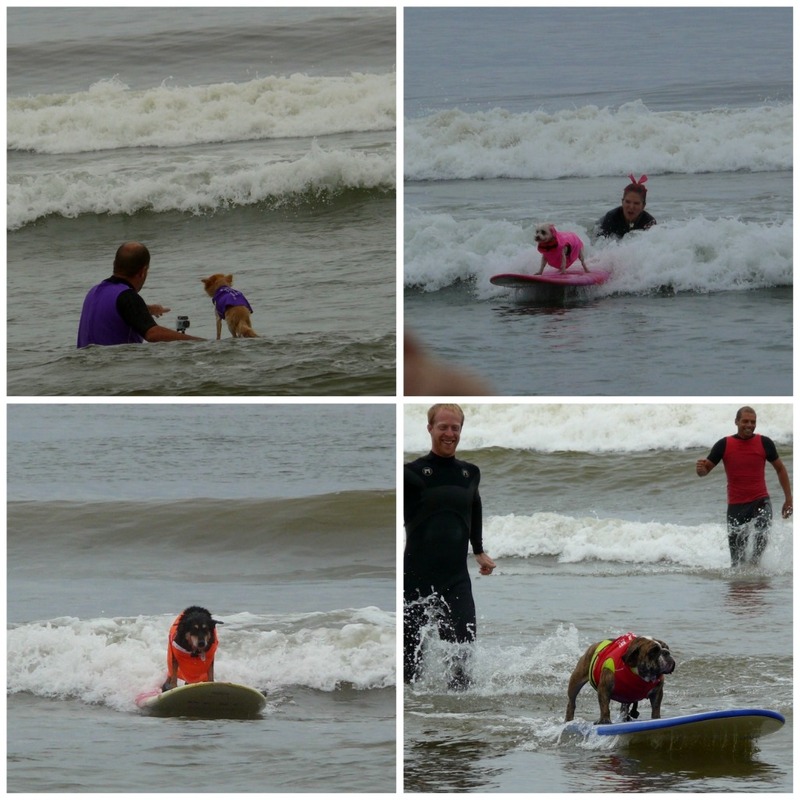 Come on in ... the waves are fine! It appears to me that a good time was had by all. And now I must go practice not barking so that I can go next year. We've been talking about it for ages. What a GREAT EVENT this is gonna be. 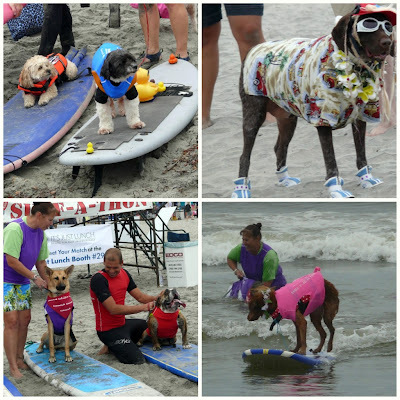 World records set for number of dogs on a board. Needless to say, I was good to go. 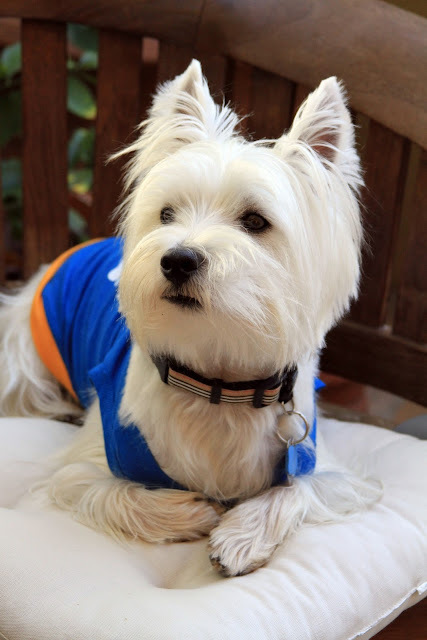 I had the perfect outfit ... totally rocking my Westie phyfursique. And do you know what I got? I GOT LEFT AT HOME. I GOT LEFT AT HOME WTH A SHARK ATTACK. I GOT LEFT AT HOME WITH A FAKE SHARK ATTACK. Maybe tomorrow I will show pictures from the actual event. If my feelings feel better. Oh, and a BIG SHOUT OUT to my Aunty Karen who came to help Mom. Yep, favorite aunt left me at home. It's just not right puppers, it's just not right. Greyhound lovers unite! At least, you're probably going to have to unite to buy this lamp 'cuz it costs $650 or so we hear. 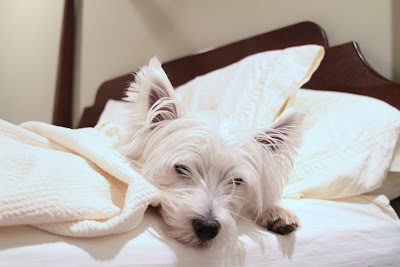 Maybe I will search for a Westie lamp this afternoon. 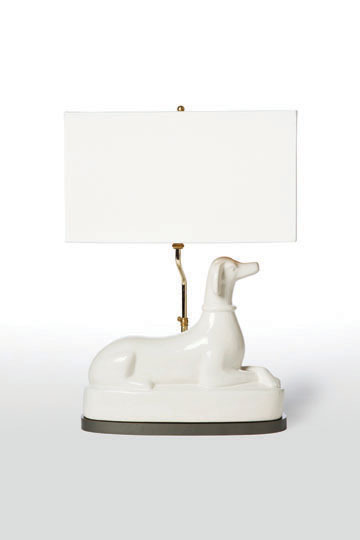 The greyhound lamp looks so cool and sleek and likely for a contemporary house. 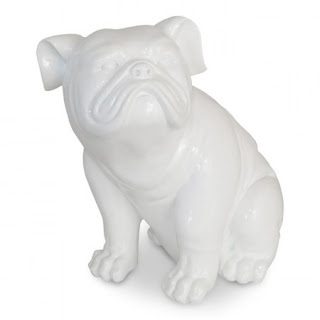 What kind of house do you think a Westie lamp would go into? A scruffy barn perhaps? English Cottage? Scotish Hunting Lodge? 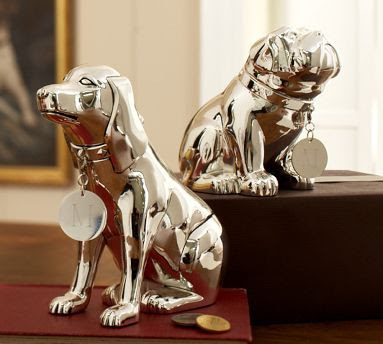 Well, I know if I was in one of my really spunky moods, I would be able to come up with the ideal comment about how piggy banks have gone to the dogs. Anywoof, look what we found when we were looking for a new dog bed bed cover on the Pottery Barn website. We think these would make great gifts for your pet loving friends and family. (Unless you want to get them something from The Puperie, which we, of course, think would be an even better idea!) And, leave it to PB to add those special touches ... you can monogram the dog tag if you'd like! Better check them out straightaway (big word alert!) because they are on sale and sure to go fast. Did you know I was almost a Wheaton Terrier? 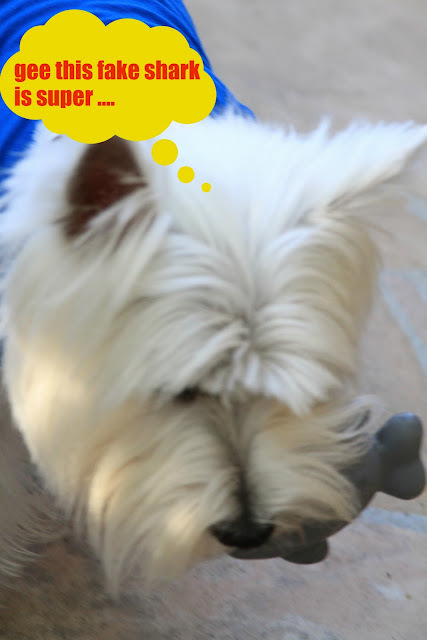 Yep, believe it or not, when it came time to get me, there were actually dogs on the list besides Westies. Anywoof, this one caught our eye. Whenever we find something that combines art and humor and graphics, we tend to LOVE it. And we are all about shamelessly promoting other businesses we love. 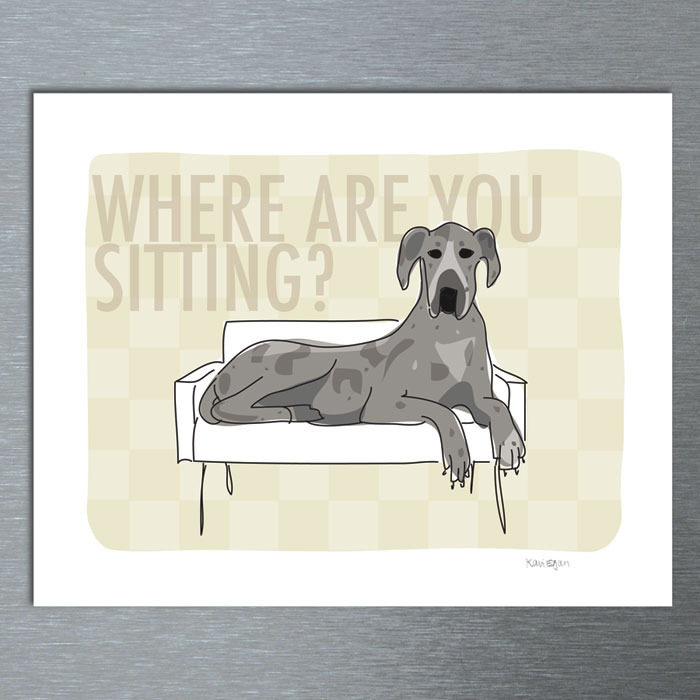 So go here to find this print, puppers. They have lots of other breeds here too. 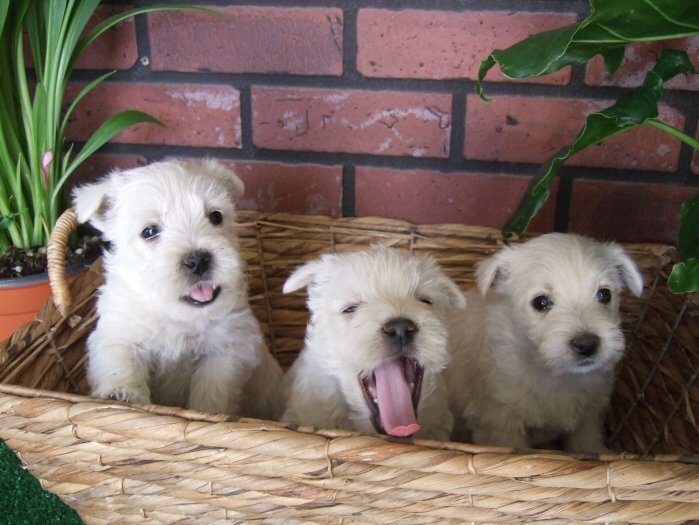 We'd be buying one of these for ourselves if they did Westies. But I think we'd all agree they should. 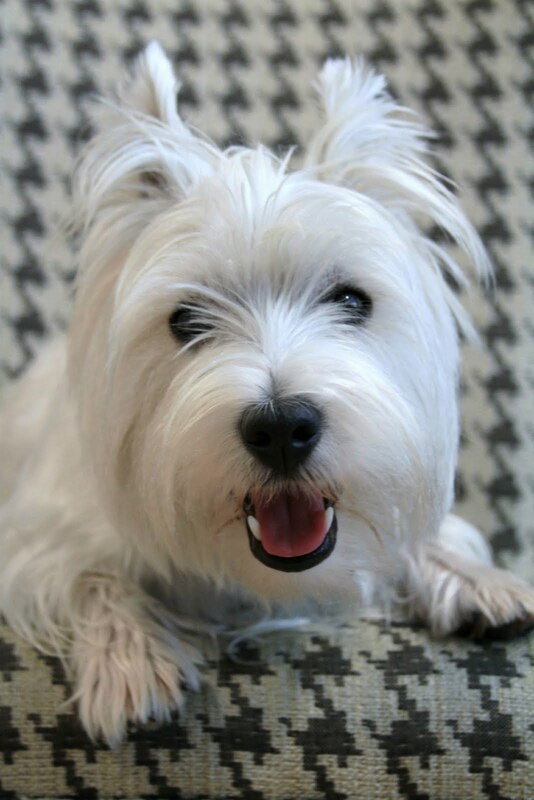 Editor's Note: Westie lovers --- there is a Westie in the works!!!! Please come back when you are called Friday. Oh, boy. This will give you a Friday warm and fuzzy! 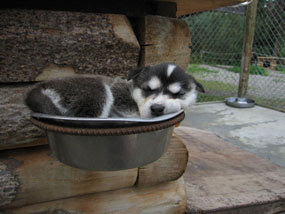 There is a puppy-cam you can check out here that shows a new liter of sled dog puppies. Allow us to introduce you to Tatum, Koven and Carpem at Denali National Park. Apparently, the managers at the park try to raise one liter a year, and the camera is turned on about three weeks after they are born. The webcam refreshes slowly, so you have to watch for a while but it's worth it because they are C.U.T.E. If the pups don't show, check back later. The first time we tried, they must have been in their snuggly pup house taking a wee little nap. Well, by now I think it's pretty clear to everybody that I SLEEP IN A PLASTIC TUB. Have I worked that "woe is me" angle enough lately???? Anywoof, while Mom was gone the other day I started pondering the whole tub thing and, you know, I did what any dog blgger worth his weight in kibble would do .... put my paws on the keyboard and googled it. We really saw them first here. 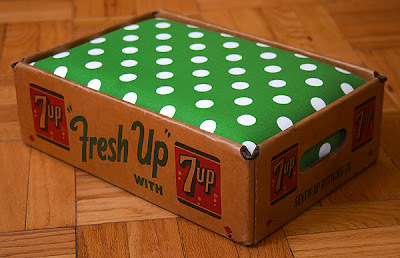 Check it out .... a dog bed made from an old soda crate. Head thunk with paw ... why didn't WE think of that???????? It comes in Pepsi too, but does anybody besides me think we ought to keep mom decaffeinated??? The Bar None Ranch lost a great one yesterday. Rover was one of the sweetest dogs you'd ever meet and it makes us very sad that he and Duncan never got to meet. You will be missed Ro Ro, but we know you're in puppy heaven hanging out with our sweet Max taking long walks and eating all the dog biscuits your tummy can hold. 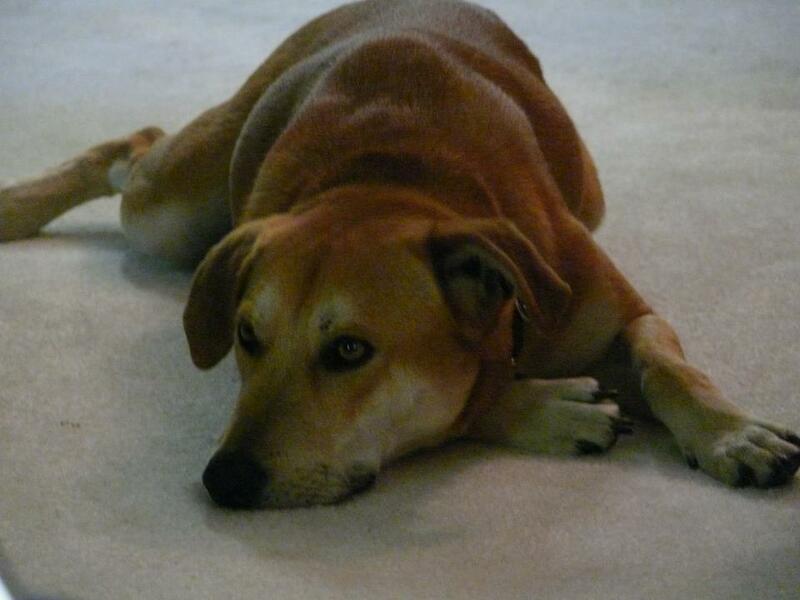 Rest in peace, sweet pup. 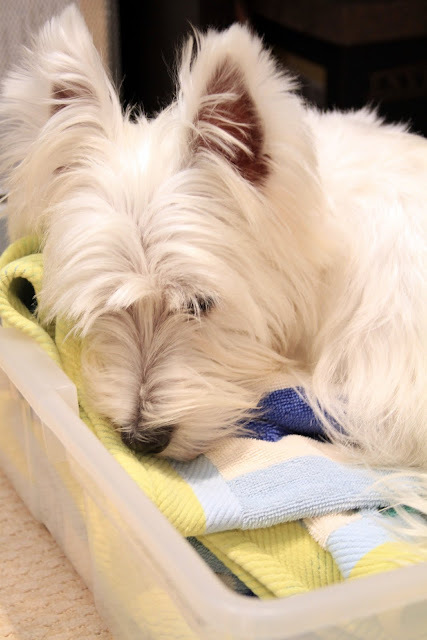 Do you suffer from allergies so you can't have a dog? Do you have a little spot in your bookcase that needs filling? Or, as is the likely case for moi, does you mom sometimes wish you were a piece of art instead of a piece of work????? If you answered YES to any of the above questions, you might want to click here and go to Joss and Main to check out these great pieces from LA Furniture Collection. Joss and Main is a sale site you have to sign up for, by the way, but I highly recommend it. They generally have great products on sale and it is about time to start thinking about your holiday shopping, you know!! I don't care if you think that it is going to be a glorious new week. I am not coming out of my tub until Friday. 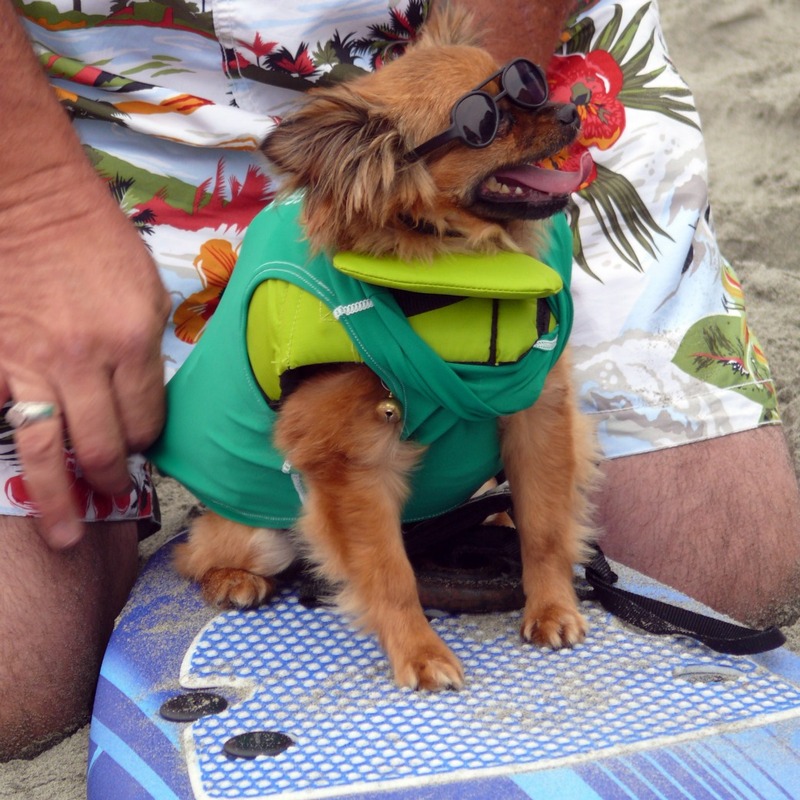 Turns out, I am a WEEKEND kind of dog. Really? You can run half of a marathon ACCIDENTALLY???? 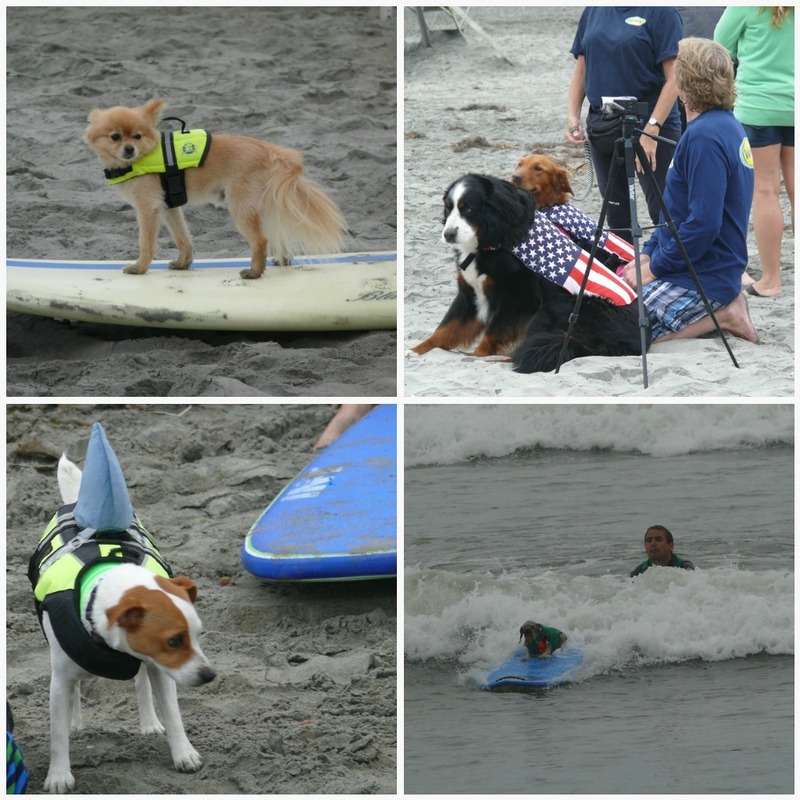 A triathadog, I am NOT. Doesn't run in my family. You ever met my mom??? We first read about this here. Apparently, there was a marathon going right by a pup named Dozer's house. He thought it looked like fun so he hopped a fence and joined the race. Apparently, he finished in 2 hours and 14 minutes ... not bad, and WAY better than me and my mom could do. If we ever tried. But I digress. 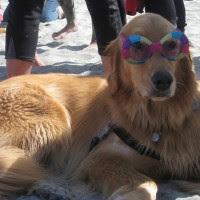 Anywoof, Dozer got a medal and had a race page created for himself, and this philanthropic pupper has raised over $10,000 for cancer research at the University of Maryland Greenbaum Cancer Center. 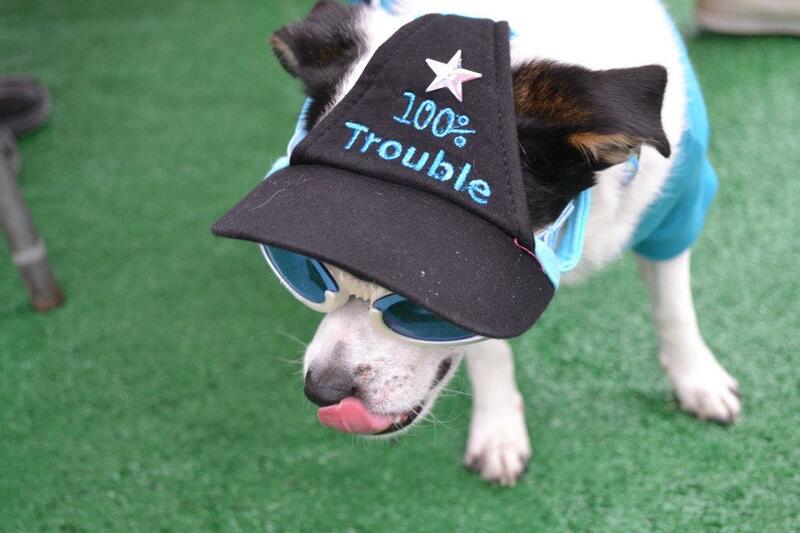 DOG HOROSCOPES: Get yours here! WOWZA! We never knew there were such things as DOG HORORSCOPES!!! We found them here in case you'd like to check yours out. Mine, I have to say, fit me like a worn in dog bed. Capricorn dogs tend to come across possessing quite serious characteristic traits, however they do have quite sterling qualities such as a cautious, strong willed attitude and there is a calmness about them which just draws you to them. 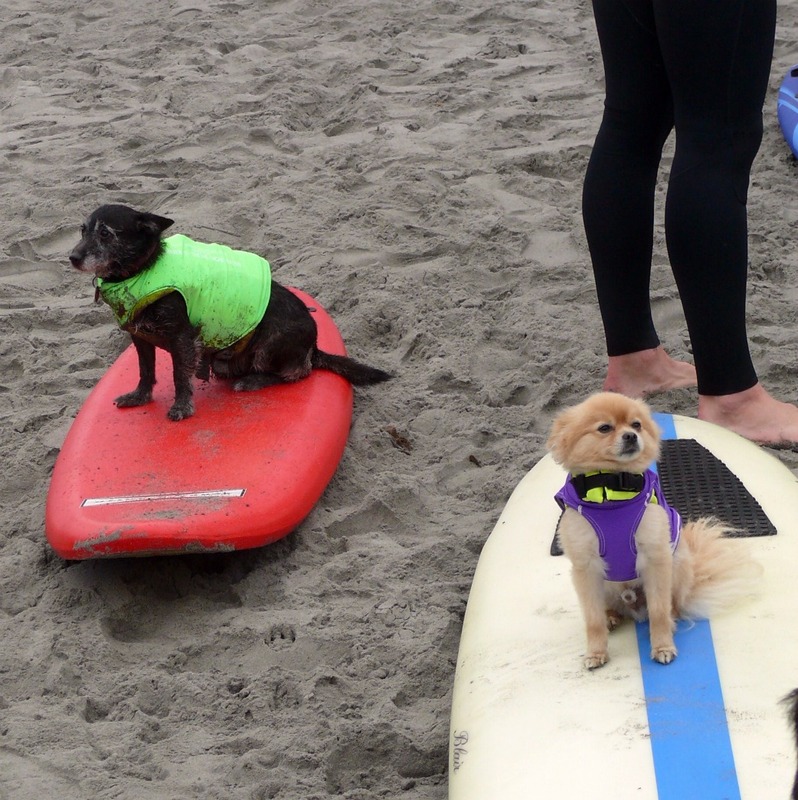 They can be stubborn when it suits them, but their owners are their world and they make it their mission to be underfoot as much as possible. Their owners can often be bewildered by their erratic behavior as they can be surprisingly active and demanding one minute and then suddenly become withdrawn and reserved the next. They have good memories and are great candidates for regular obedience training as they have an insatiable appetite for learning new things and don’t mind showing off what they have mastered. They are very cautious and wary of people they do not know very well, preferring not to meddle with them which in turn doesn’t allow interference with themselves. They make great lifetime mates with other dogs in the household and are intensely loyal and dedicated to them. Capricorn dogs tend to suffer from skin ailments and digestive upsets caused by their cautious nature and tendency to worry about nothing in particular." WOW, they really pegged me, puppers. They really pegged me!!!! Lost Keys? Let the dog fetch them! 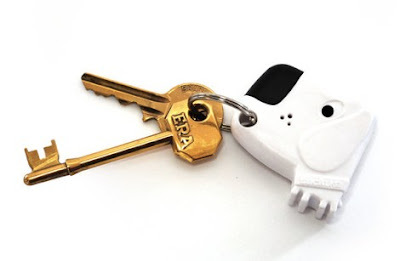 Now here is a product we think we'd really like to get our hands on ... this dog shaped keychain is designed to fetch your keys for you. According to the website, all you do is whistle and it sets off the alarm in the keychain and the dog's nose starts flashing, theoretically guiding you to your keys. Dad, pretty sure this is gonna end up on Mom's list, so you might as well know that you can find it here.